It was hard to feel like I got much done today, as the changes are quite minimal in the photographs, but it’s all part of it. You may have seen previous photos where I’ve had a bridge positioned on my guitar, but I haven’t actually created the bridge yet. In those photos, the bridge was a temporary bridge, used to align the neck when attaching it to the body. 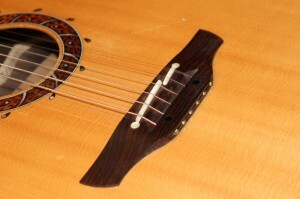 I want to design a bridge like the bridge on my Takamine guitar. The beauty of a custom made guitar, is you can pick and choose bits you want and discard those you don’t want (to a certain degree). I’ve combined elements from my two most played guitars – The Takamine Ltd Ed 2006 and the Maton EA80C. Although the most popular bridge seems to be that of the Maton, where you have pins to hold the strings in, I would like to avoid the use of pins. I don’t like to fuss around with pins when changing a string at a gig. The Takamine bridge is a lot easier to insert a string; much like a classical guitar, you thread the string through the wood and it’s anchored by the string ball on the end. So my aim is to design something similar, with respect to my visual theme. I started out with a chunk of gidgee that needed to be around 8mm thick. When holding a straight edge along the frets and down over across the bridge, the ruler should sit a few mm above the bridge (imaging a saddle). I put the wood through the drum sander to get it to this thickness. There are several measurements on the bridge. Firstly I must get the position of the saddle. 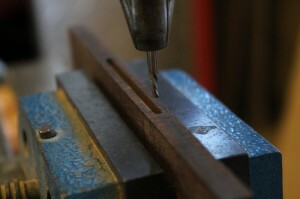 A slot will be drilled through for saddle 70mm long in the centre of the bridge (35mm on each side of the centreline). The saddle does not sit parallel to the edges of the bridge though, it’s slightly angled. 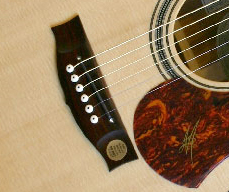 To get that angle, measure from the edge of the bridge closest to the sound hole – on the TOP E string , the mark needs to be made at 5mm from the edge of the bridge. 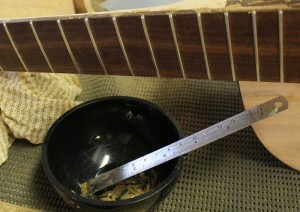 At the BOTTOM E string, a mark needs to be made at 8mm from the edge of the bridge. Join them up to create the 70mm saddle line. Ahhh!! Does that make any sense????? Using a 2mm wide router piece, I routed a slot for the saddle. I had to get the depth to be 4mm. The process of routing is not as simple as one clean sweep and you’re done. Because the wood is Gidgee and it’s so hard, you need to peel off fractions at a time to avoid breaking the router piece! 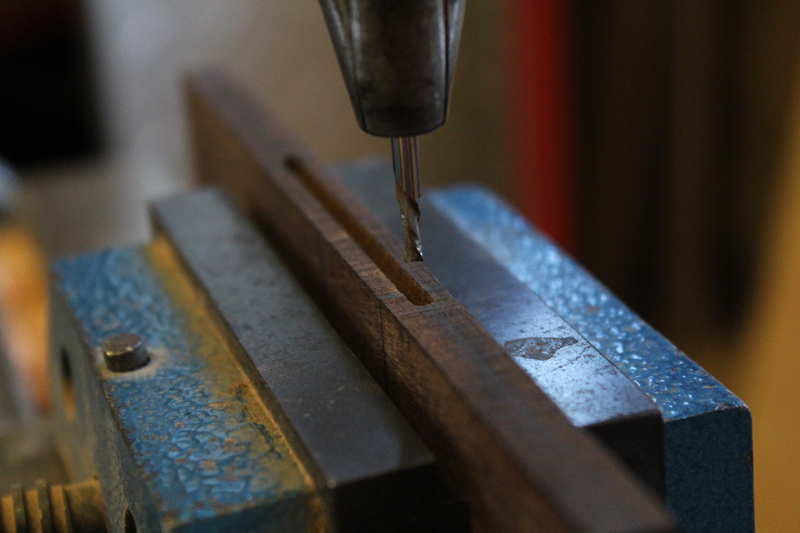 I also routed a slot on back end of the bridge about 6mm. 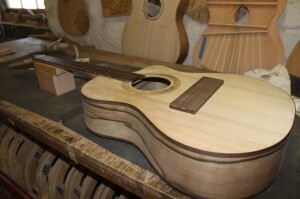 This is were the strings will be insert. I looked through bridge designs to pick something that would compliment my visual theme (some curves here and there…). I was going to go out all radical and do something asymmetrical. But there’s a reason why the bridge is designed as it’s designed. There’s a fine balance between having TOO MUCH wood, and having NOT ENOUGH wood. You don’t want the bridge to be bulky, as this will restrict the movement of the soundboard, and thus restrict the sound. But you also don’t want to make a bridge so small that there’s not enough surface area to glue the bridge and be confident it will hold the string tension. I went somewhere in between. I got out the tracing paper and designed a bridge in between the Maton size and the Takamine style. But I couldn’t work on the bridge any more than that. I need to bring my Takamine guitar in to show Chris the actual bridge (a photo is not enough information). I will continue the bridge design next session. The bridge is a CRUCIAL part in getting the action and intonation right. 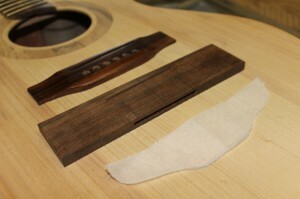 Inevitably there are tiny little gaps here and there around the guitar where the join hasn’t been perfect during gluing. There were some slight gaps around the rosette, some in the book join on the back of the guitar, tiny little gaps where the fret wire didn’t go in as deep as the cut on the fretboard, around the bindings, etc. Mostly the joins are seamless, but I wanted to fill the gaps that were there, no matter how slight, to create an even surface when it comes to oiling the guitar. I created a paste made from glue and saw dust to do this (although some parts I’ve previously done with a wax). To match the colour, I used the sawdust from the same wood. The idea is that you clot the gap up with the sawdust paste, it dries and you scrap/sand it off. For the most part, I could fill the gaps in the dark gidgee and QLD maple in a way that one wouldn’t notice the filling. But Sassafras was the hardest to fill. It’s riddled with amazing colours. I created sawdust paste out of the original sassafras sides that I’d snapped during the bending of the cutaway. But the colour varies so much in the wood, I didn’t fill the gaps terribly well – matching the colour variation. I’m mega disappointed with the filling around the rosette, and this will need to be refilled. I suspect that I am up to the part where I’m about to start sanding the guitar, all over, for many hours. I’m at that point where I need to tidy up the guitar and prepare it for oiling. I’m sanding at 120 grit at the moment, but I will need to get finer and finer as I smooth out the entire surface. 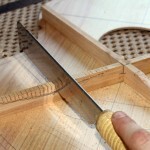 Let the sanding games begin…..
DAY 23 – 4/4/2012 10am-5pm.